James OSullivan, CEO of Mazda North American Operations. 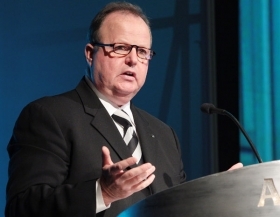 DETROIT -- If automakers know their brands core strengths and weaknesses and react quickly to events, theyll make it through the next 18 months, the CEO of Mazda North American Operations said today at the Automotive News World Congress. Jim OSullivan said he believes the industry is in for a rough time at least until the middle of 2010. Total annual sales, he said, could be stuck in the 11 million-unit range this year, with sales picking up in the fourth quarter. Mazda, with a U.S. sales decline of 10.7 percent last year, fared better than the U.S. market, which declined 18.0 percent. Only two Mazda models gained in sales last year -- the Mazda5 compact minivan and the CX-9 crossover. Mazda has seen tough times before, OSullivan said, and will use what it learned in the past to survive the credit crisis and lack of consumer confidence that is sapping auto sales. OSullivan recounted two brushes with death Mazda had in the 1970s and 1990s, when it veered from its core values of building stylish, technically advanced, fun-to-drive vehicles. In the early 1970s Mazda relied on the low-mpg rotary engine. Its sales collapsed after the Arab oil embargo of 1973. But Mazda engineers went to work and rolled out a car with a traditional engine, the Mazda GLC, which put the company back on the road to profits. Then, in the 1990s, Mazda tried to expand too quickly, building too many vehicles that consumers did not associate with the brand. The successful company will learn from the past, look ahead, adapt and move ahead. Mazda has been there before several times. We survived by returning to our core strength, he said.  Mazda is closely watching Hyundais program that allows consumers who lose their jobs to return their cars to the dealer. He said it was a good program that could help restore consumer confidence. Mazda has no plans to offer a similar program.  Mazda has no plans to launch a line of luxury cars.  Mazda will not expand its manufacturing presence in the United States in the next few years. The company builds cars in Flat Rock, Mich., at a joint-venture plant with Ford Motor Co.